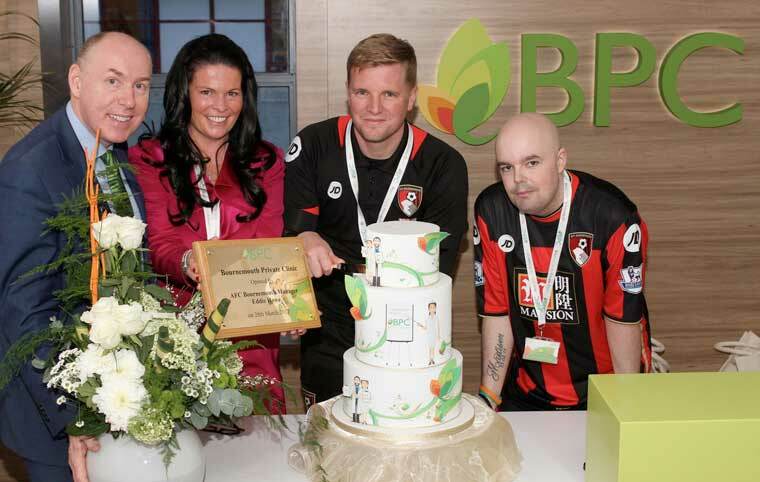 AFC Bournemouth manager Eddie Howe has opened a new private patient unit that will provide extra income to support NHS patient care at the Royal Bournemouth Hospital (RBH). More than 100 local business leaders, health insurers, GPs and medical consultants attended the official launch of a new private patient unit at the Royal Bournemouth Hospital on 28 March to preview the new unit’s facilities. Opened by Eddie Howe, AFC Bournemouth manger, he said, “It’s no secret the NHS is struggling to sustain funding to provide high quality care to all its patients. When used responsibly by NHS trusts, renting NHS resources to private patients when they aren’t being used can provide a good source of additional income to support NHS patients. The unit will be run by Bournemouth Private Clinic (BPC), an independent organisation created by The Royal Bournemouth and Christchurch Hospitals NHS Foundation Trust (RBCH) to develop its private patient services. The clinic’s sole purpose is to generate RBCH extra income that can be used to provide resources for NHS patients, with more than £3m already reinvested to date. Contained within the unit are four bedrooms in a private patient ward, two consulting rooms and a treatment room. It will operate six days a week as a standalone service. When crossover services are required, such as operating theatres, the NHS will be able to generate income by renting resources to BPC when they are not being used by NHS patients, who will still have priority. To find out more about BPC and access the clinic’s list of frequently asked questions about how NHS private patient facilities can benefit NHS patients, visit www.bournemouthprivateclinic.co.uk.